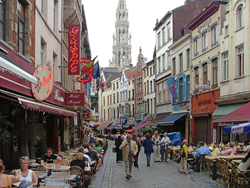 The Business Architecture Guild® is combining 2 events in Brussels Belgium, an Innovation Summit and a Transportation Reference Model Workshop. The event features practitioners and experts from around the globe. Brussels is the heart of Europe! For those new to the discipline, consider attending the Business Architecture Primer being offered on Monday afternoon, prior to the Summit. Special this year, in conjunction with the Summit, the Business Architecture Guild and OMG are also pleased to sponsor a 1-day Business Architecture Transportation Industry Reference Model Workshop on June 8, 2017 - also in Brussels. The workshop will evolve the Transportation Industry Reference Model. This workshop will include work that engages with a cross-section of transportation industry companies including airlines, shipping companies, urban transport and others. Stay with us or join us after the Summit for this unique experience of hands-on building capabilities and value streams. This is the perfect practice-run for your own firm's mapping projects. To register for any or all of these events, follow this link. The primary purpose of the Business Architecture Guild® is “to promote best practices and expand the knowledgebase of the business architecture discipline.” The Guild is an international, not-for-profit, member-based organization that provides valuable resources to business architecture practitioners and others interested in the field. The Business Architecture Guild® is the source of A Guide to the Business Architecture Body of Knowledge® (BIZBOK® Guide) and providers of the Certified Business Architect (CBA)® program, which certifies business architects worldwide. For more information visit http://www.businessarchitectureguild.org.